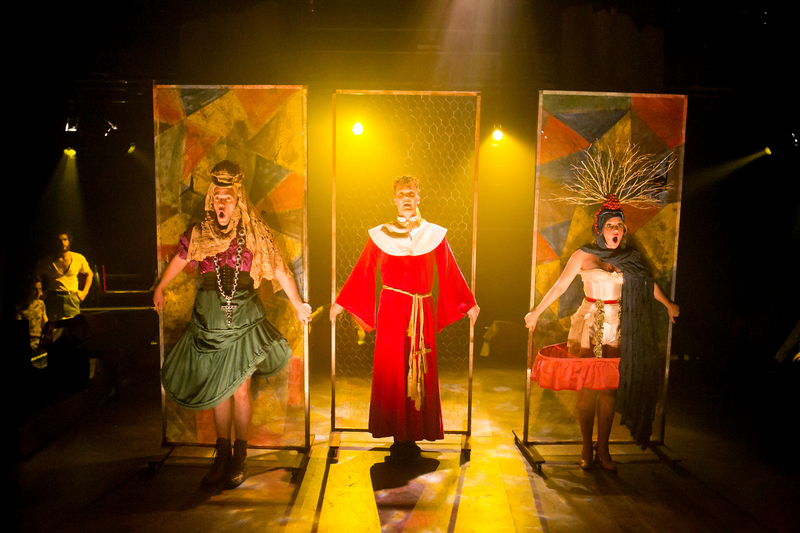 Independent company Squabbalogic is known for its inventive productions of little seen, contemporary musicals. 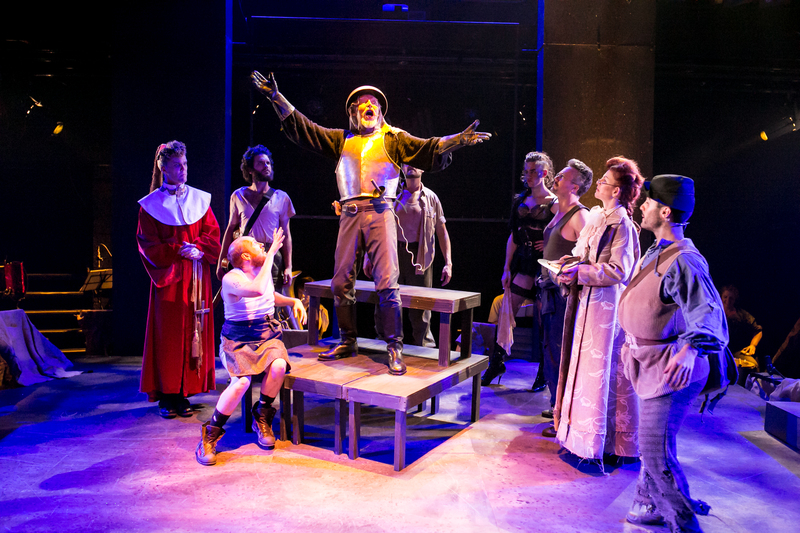 It now presents a brilliantly re-imagined staging of a hoary, 50-year old classic: Man of La Mancha. Written as a play-within-a play, author/actor/tax collector Miguel de Cervantes is imprisoned by the Spanish Inquisition. When his fellow inmates subject him to a mock trial of their own, Cervantes tells them the story of Alonso Quijana, a crazed gentleman who believes he is Don Quixote, a knight-errant on a quest to better the world. Director Jay James-Moody and his terrific design team (set by Simon Greer, costumes by Brendan Hay, lighting by Benjamin Brockman, sound by Jessica James-Moody) set their gritty production entirely in a dark, dingy prison dungeon (as the first production was originally staged before being expanded and romanticised). We never forget that this is Cervantes mustering the prisoners to help tell his tale, but the performances are so beautifully delineated that we experience and embrace both layers of the storytelling at the same time. The prisoners are as well characterised as the roles they then take on in Don Quixote’s world. The lo-fi staging is simple, with a few benches rearranged for different scenes, yet it’s also beautifully detailed from the horse costumes to the kinks in Don Quixote’s sword after his tilting at windmills. The staging makes clever use of the intimate theatre, including the balcony around it, to engender an oppressive atmosphere (heightened by the sound of clanking and screams) but allies that with a rudely vigorous performance style. Hay’s costuming is a convincing combination of the grubbily makeshift and the more colourful outfits that Cervantes might well have had in his theatre trunk, adding an element of sexiness among the squalor. Also heightening the DIY feel is the decision to have the actors play the score on a range of instruments, led by musical director Paul Geddes on piano. At the heart of an excellent ensemble, Tony Sheldon gives a stellar performance. He is suave as Cervantes and dignified, gentle and frail as Quixote, his rendition of The Impossible Dream speaking to us afresh and tearing at the heartstrings. It’s a revelation after umpteen bombastic versions sung out of context with little sense of the song’s true meaning. Marika Aubrey is a spunky Aldonza, the abused barmaid and part-time tart in whom Quixote sees beauty as his honoured Lady Dulcinea. 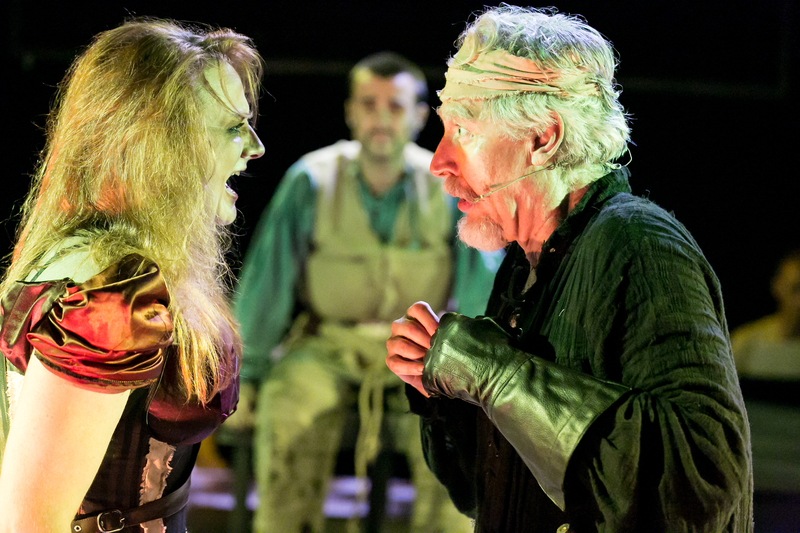 Aubrey brilliantly captures the tough, cynical carapace Aldonza has built for self-protection and then touchingly conveys the new hope she gradually, briefly allows herself to feel in Quixote’s eyes. The final scene between her and Sheldon is incredibly moving and inexpressibly sad. Aubrey is also impressive vocally and raises the roof with the song Aldonza. Ross Chisari is endearing as Quixote’s chirpy sidekick Sancho Panza and his choreography suits the production’s aesthetic. Glenn Hill is in fine voice as the padre, as is Stephen Anderson as Alonso’s housekeeper. Joanna Weinberg lends weight to the antagonistic roles of the prison prosecutor and Dr Carrasco, who wants to marry Alonso’s niece but is worried about being associated with a madman, while James-Moody turns in a memorable comic cameo as the barber. However, credit is due to all the performers: Hayden Barltrop (who is there primarily as a musician on clarinet, keys and bassoon), Reece Budin, Laurence Coy, Courtney Glass, Hay (who performs as well designing the costumes), Rob Johnson, Shondelle Pratt, Kyle Sapsford and Richard Woodhouse (whose guitar playing is gorgeous on Little Bird). 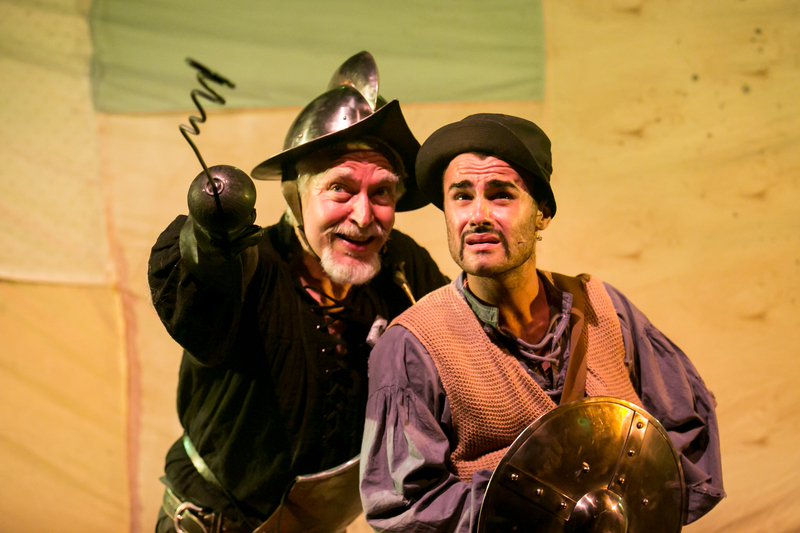 There’s no disguising Man of La Mancha’s creakiness. The book (Dale Wasserman) and lyrics (Joe Darion) are clunky at times, while Mitch Leigh’s Spanish-influenced music can feel samey and rather dirge-like. Despite all of that, Squabbalogic gives us an exciting, inspiring and genuinely moving piece of theatre. Recommended. This entry was posted in Musical Theatre and tagged Benjamin Brockman, Brendan Hay, Courtney Glass, Glenn Hill, Hayden Barltrop, Jay James-Moody, Jessica James-Moody, Joanna Weinberg, Kyle Sapsford, Laurence Coy, Marika Aubrey, Paul Geddes, Reece Budin, Richard Woodhouse, Rob Johnson, Ross Chisari, Shondelle Pratt, Simon Greer, Stephen Anderson, Tony Sheldon by jolitson. Bookmark the permalink.